Well, ready or not mobile banking is here! It is available for anyone willing to give a try! Sites such as Obopay allow anyone to sign up and create a mobile banking account. The mobile banking allows anyone to send or accept money by sending a text message on a cell phone. No need for wallet, credit cards, change...etc. You send a text message to Obopay and the phone number of the recipient of the funds (the recipient does not need to be registered at Obopay!). Obopay does charge .25 cents to send funds (although it does not matter how much you send) and it does not cost the recipient any money. You can add money to your obopay account online with a credit card, bank account transfer, or even PayPal. 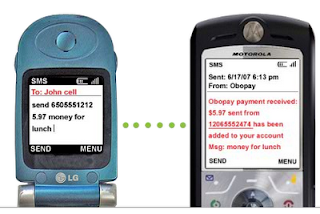 People can also send you money via cell phone without an Obopay account! Now that mobile banking is no longer a "futuristic" idea, shouldn't businesses and economic classes be teaching students how to deal with their finances in the mobile world? This is not the only mobile banking option, and it just touches the surface of the mobile banking possibilities! Teachers could set up a mobile account and students could responsibly spend and collect money from the account for a business related project. Obopay pay tracks who is sending money and where it is going. It might be an easy way to raise funds (since people do not have to have an Obopay account to send money). Since Obopay keeps track of all funds, senders, and recipents, it might be an easy way to keep track of finances. The cool thing about mobile phones as a parent buying the plan for your child, is that you can order the phone conversation records and find out what your kid is up to all the time. It's like a video camera is on your kid at all times. Some plans even have a GPS location device on it so you can know where your "phone" is at all times. Then you can parent your child accordingly. Teens and university ages think it's all made up, but us parents know better. This is interesting. I am always amazed by this site and how it keeps up with all the current trends and innovation with cell phone applications. Even though this sounds interesting, how is this any different than banking by phone. The same way I can call my bank and check a balance and transfer funds. I am interested to know, it says all you need is the other parties cell phone number and they do not have to be a member of Obopay--how do they get the money then? It one aspect it sounds simpler because I guess you can just send a text. Regardless of how you bank, it would be useful to teach students how to utilize this. This way they can monitor their finances to make sound financial decisions. At the risk of sounding old-fahioned, this sounds pretty easy to hack. Are you sure that transferring money without dependable tracking mechanism is a good idea, especially for adolescents? How often have your students lost their phones? Does that now mean that their bank account info is compromised? I think the thing to teach here is how to be responsible with money. I don't know that it is any easier to "hack" than web-based banking (which is very mainstream today). If you know the password and login to a web-based account, you can "go to town"...the same could be true of any mobile banking (such as knowing the keycodes...etc). However in some ways mobile banking could be safer because you have to transfer funds "out" from your own phone (no one else can). I do agree that we need to teach students financial skills. I think that mobile financing will become much more prevalent (the days of writing checks are probably numbered).